The University of West Florida’s VIP Pass was created directly for the President of the University to hand out to close friends of, donors to, and members of the University’s Booster Club and other organizations. These were made twice a year to highlight the spring and fall sports. 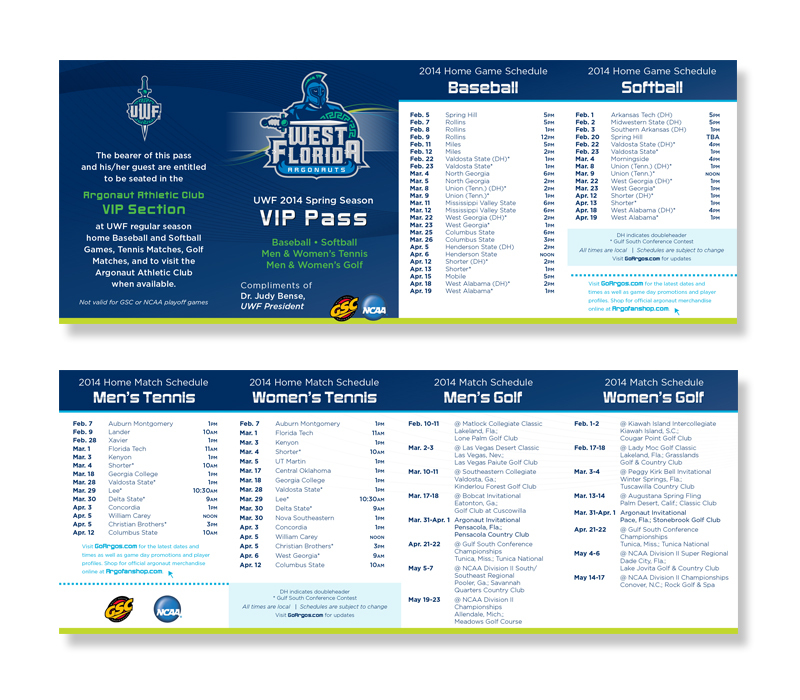 Each pass includes a schedule of all the home games and grants free access to each event. The tougher part about the VIP pass was fitting the abundant information of each sport on such a small workspace (double roll fold compressed down to 2″x3.5″). This was accomplished by meticulous typesetting and different font weights to make the information clear and precise. Where certain sports had a smaller schedule, the space was used to promote the University’s athletics website, store, and boosters club.